Of course this is a serious deal for tobacco companies going forward and let’s not forget the design companies that do their work who are paid extremely well but never publicize such relationships for fear that it would affect their own corporate brands. (I know because I worked for one of them). The New York Times spoke to Imperial Tobacco who ludicrously responded by saying that there’s no evidence to support this action as effective in reducing consumption. Well, er, no…it hasn’t been done before so no, there isn’t evidence yet, but you just wait. And interestingly publicly trading tobacco giants Philip Morris (PMI) and British American Tobacco (BAT), Australia steered clear of stating the legal action that the industry could pursue but both wanted to put the possible case forward of there being constitutional issues relating to intellectual property and international trade obligations. Currently Australian cigarette packaging carries health warnings as well as graphic photographic images showing the possible results of long-term smoking such as gangrenous limbs, cancerous mouths and blindness. (See above image). So, what does the government intend to do with the $5 billion generated over four years that it forecasts to make out of this initiative? It will be reinvested in the national health care system. Take note America! 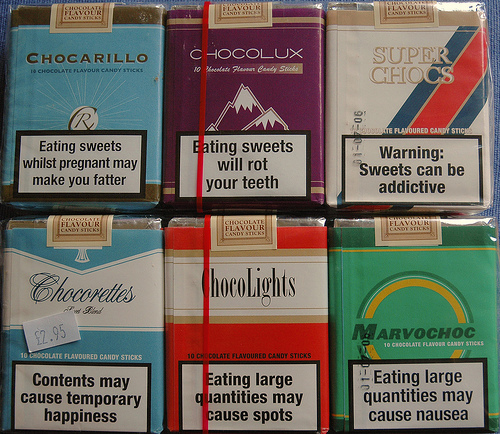 Anyone remember chocolate cigarettes? Well, you can still get them, frighteningly enough. In my opinion, these should be banned too. At least the ones below have health warnings about chocolate consumption!